Iatrogenic injury is a feature of all medical practice but it is perhaps nowhere more accepted as an unavoidable consequence of therapy than in obstetric and neonatal medicine. Classical obstetric iatrogenic pathology has been with us since time immemorial, and despite the recognition of causal factors remains a not infrequent occurrence (Ennis and Vincent 1990; CESDI Fifth, Sixth, Seventh and Eighth Reports 1998—2001, www. cemach.org.uk). 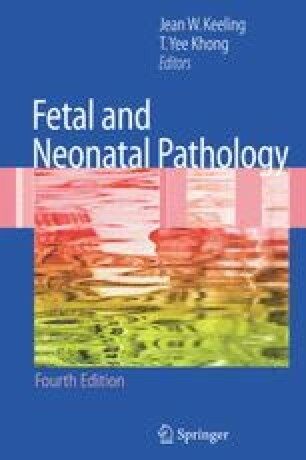 The development of invasive antenatal investigation and treatment and the increasingly complex interventions in neonatology have resulted in the appearance of new types and patterns of pathology.